Two UC Agriculture and Natural Resources emeritus specialists, two UC ANR advisors and a UC ANR vice provost spent a week in March working in Guatemala to help implement a USDA-funded (UC Davis-managed) project that is rebuilding the extension system in Guatemala. With a population of almost 17.5 million and a per capita income ranked 118th in the world, Guatemala is working to improve the livelihoods and incomes of it's rural population, which represents nearly half of the total population. 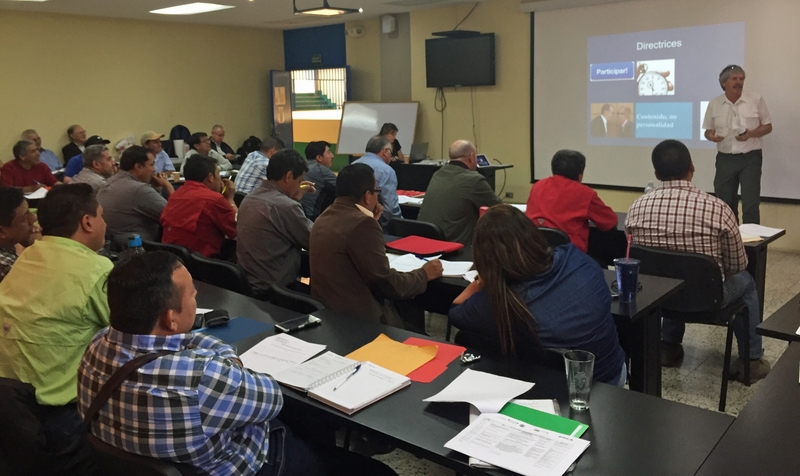 The project is being implemented in Guatemala with the Universidad de San Carlos. Universidad de San Carlos is the biggest and oldest university in Guatemala and which - when established in 1676 - was the fourth university established in the Americas. The 150,000-student university includes a prominent and well-known agricultural school. The UC contingent delivered modules on extension and marketing, two of five required for the participants to receive a certificate. Jim Hill, emeritus rice specialist based at UC Davis, is leading the second phase of the project. The rest of the team for the week were Steve Temple, emeritus agronomy specialist, UC Davis; Jairo Diaz, director, UC Desert Research and Extension Center; Ramiro Lobo, advisor, UC Cooperative Extension, San Diego County; Mark Bell, vice provost, strategic initiatives and statewide programs; and Kate Lincoln, CAES Global Engagement, UC Davis. Bell led the project when he was part of the UC Davis College of Agricultural and Environmental Sciences. UC ANR vise provost Mark Bell leads a classroom discussion in Guatemala. 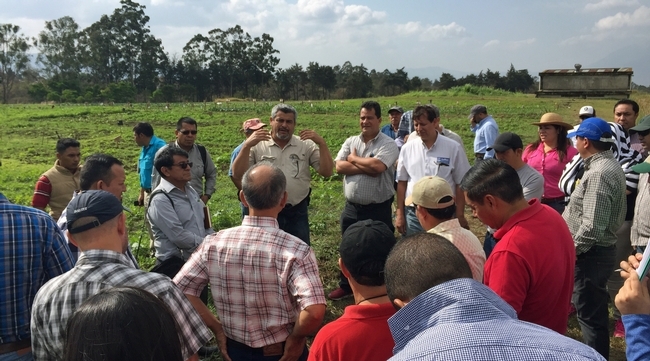 The interactive week-long course worked with 31 participants, mostly from the Guatemalan Ministry of Agriculture extension offices, but also included agriculture teachers. The team shared the essential steps and associated skills required for successful extension. The course used the Spanish acronym ASISTE as a framework (previously developed by Mark Bell, Maria Paz Santibanez and Elana Peach-Fine) as an easy way to remember the key steps. ASISTE stands for audience (audience), soluciónes (solutions), información simple (simple information), transferencia (transfer), and evaluación (evaluation). As part of the course, participants developed and delivered their own mini-workshops using local issues and context to reinforce workshop discussions. As Guatemala has a large indigenous population with more than 20 languages, one of the participants delivered his talk in Tzutuhil, the main language used for his constituents in Santiago Atitlan, Sonora department. UC Cooperative Extension advisor Ramiro Lobo talks to the group during a field session. Surendra Dara, UC Cooperative Extension advisor, explores innovative options to control pests using microbials as biological controls. Early in life, Surendra Dara decided that no matter which field he chose, he needed to make an impact on it. Always interested in science, he chose agriculture and specialized in entomology. Dara is now an entomopathologist with the University of California's Division of Agriculture and Natural Resources in San Luis Obispo, and has an established reputation for exploring innovative options to control pests using microbials as biological controls, and showing growers how they can also help with plant growth, drought resistance and fighting diseases. After watching that drama unfold, Frank Mitloehner, a leading scientist on agricultural emissions at the University of California, Davis, was thrilled when two outreach staff affiliated with AOC's network reached out to set up a call to discuss the potential for climate mitigation efforts in agriculture. The call, held earlier this month, lasted more than an hour, Mitloehner said. “I was very glad to inform of what I know, and they were very receptive to it,” Mitloehner said on Agri-Talk last week. During the segment, he urged agricultural producers to not dismiss the left-wing climate effort. …Picquette's two sons have been raising goats for the last five years as a 4-H project. Losing their animals has been especially hard for the boys, Picquette said, adding that they had planned to use money won during competitions to pay for college. The plan by the California Department of Forestry and Fire Protection, or Cal Fire, comes at the request of Gov. Gavin Newsom. On his second day in office, Newsom asked the agency to develop a proposal to address the increasingly destructive fire seasons that have rattled the state and are expected to worsen with climate change. …In the meantime, many researchers say the most effective approach to fire protection is not in the forests, but in communities. They recommend making homes more resistant to fire with hardier construction materials, and clearing the vegetation around them. … The four figs were planted at El Pueblo by agriculturalist and City Councilman Elijah Hook Workman, KCET reported in 2013. The Ficus macrophylla was brought from Australia to Southern California in the 1860s and 1870s, probably to provide shade and ornamentation, said Donald Hodel, a horticulture advisor for the University of California's Cooperative Extension. Hodel described the Moreton Bay fig as a commanding breed of tree with an enveloping canopy that threw plenty of shade. Hodel said he last saw the El Pueblo figs about six years ago. “I wasn't too impressed by their health or their size, considering they're 140-something years old,” he said. When Leia Carrico, age 8, and her sister, Caroline, age 5, disappeared into the woods around their home near Benbow on March 1, the whole nation held its breath for the next 44 hours until they were found. But, though their 4-H leaders were worried, too, they say they also knew the girls had something many other children don't–they had survival skills from a class taught by their Outdoor Adventures 4-H project leader, Justin Lehnert. Lehnert is being honored in Washington, DC, on Tuesday for his role in teaching Leia and Caroline outdoor skills. Following a healthy diet can come with a hefty price tag, but a team of researchers has outlined a way for consumers to stick to a healthy diet -- and also stick to their budgets. According to the team, consumers -- and their families -- can have healthy meals if they focus on buying items in bulk and planning meals in advance. …As it turns out, neither side was accurate. Republicans are likely to continue linking Green New Deal priorities to a supposed hamburger ban. But if you don't hear about cow farts anymore from AOC, it may not be because of GOP criticism. Frank Mitloehner, an animal scientist and air quality specialist at the University of California, Davis, insists cattle flatulence isn't the problem it's made out to be, and says he helped set the record straight. Here's what seems to have happened. On February 4, shortly before Ocasio-Cortez announced the Green New Deal, she was speaking to school children in Queens, New York. When one asked how they could “combat” climate change, Ocasio-Cortez offered two practical options—stop using disposable razors, and skip meat and dairy for one meal. “Dear @AOC: we all try to help the climate,” he wrote. “However, the two options you offered have low impacts compared to the 800lb gorilla, which is to reduce fossil fuel use. About ⅔ of greenhouse gas emissions in the US stem from transport and energy prod&use. Meat/milk = 4 % of total GHG,” referring to findings in a recent EPA report. …Khaled Bali is a University of California Department of Agriculture and Natural Resources statewide water and irrigation specialist who has been working since 2016 on a four-year trial on sunflower varieties. He was asked by the University of Georgia to help ascertain which varieties were drought resistant. He chose to conduct his trial in the low desert region of the Imperial Valley, since it gets little rain during the growing season between February when it's planted, and June when it's harvested. This would make it easier to control and measure the actual water applied to the crop varieties. “We're looking at 285 varieties of sunflowers, to see which ones do well under stress,” Bali said. He has tested different plantings each growing season for the past three years, and will finish the trial this year. … Helen Dahlke, a hydrology expert and professor with the University of California, Davis, Department of Land, Air and Water Resources, has been working with farmers, studying on-farm groundwater recharge locations and suitability for various crops. "In many regions, we can definitely do more actively recharging our groundwater aquifers," said Dahlke, who currently has trials on alfalfa at the UC Kearney Agricultural Center. "It really depends on what region, how much surface water is available for recharge, what kind of sediment structure or hydrogeology we have underneath and whether it's suited for conveying large amounts quickly." Despite abundant precipitation in recent weeks, she said the timing is not the best for studying impact of recharge on certain crops. "We prefer on-farm recharge to happen in January and February, just because that is considered the dormancy season for most crops," Dahlke said. "With almond trees already blooming, often there is a greater risk of applying water on those crops." She said recent precipitation has helped groundwater recharge overall, but there is "very little way of estimating how much it is helping." Halfway through a two-year irrigation trial to test furrow irrigation versus drip on sugar beet in California's Imperial Valley, Ali Montazar is looking for ways to boost yields with as little water consumption as possible in a region where furrow irrigation is the common practice. Montazar, irrigation and water management advisor with the University of California department of agriculture and natural resources (UCANR) in Imperial County, is comparing and evaluating sugar beets for crop water use, sugar percentage, and yield, using both furrow and drip, since growers are now thinking of switching to subsurface drip. Preliminary results from year one of the trial show that yield and crop water use are better with drip. Yield was 21 percent higher, and water use was a few points lower. Frank Mitloehner, an animal-science professor and air-quality Extension specialist at the University of California-Davis, reached out to Ocasio-Cortez's team about agriculture and the Green New Deal after seeing social media posts late last month about “farting cows” that drew a great deal of attention. “I appreciate her interest in climate-change mitigation, but the 800-pound gorilla is the use of fossil fuels, and I told her that even the notion of cow flatulence makes this whole thing sound silly, and that's not what we need this discussion to be,” Mitloehner told DTN in an interview. The EAT-Lancet Commission on Food, Planet, Health is backpedaling as industry leaders and scientists poke holes in its “planetary diet” released in mid-January that is supposed to improve human health and planet health. Air Quality Extension Expert Frank Mitloehner of the University of California Davis joined Chip Flory on AgriTalk Monday to discuss EAT-Lancet and Green New Deal in more depth. ABC7 News spoke exclusively to the 4-H instructor who taught two young girls the life-saving skills they needed to survive a weekend lost in the woods. … Their mom, Misty Carrico, says she's not sure her daughters would have survived, if not for their 4-H program. "The group leader Justin has taught them fire making skills and wilderness survival skills." Justin Lehnert, the girls' 4-H leader, said, "I'm ecstatic that they did the job that they did. They're very strong girls and they stayed calm." … Nine-year-old Caroline Gelormini has been a member of the San Bruno-South San Francisco 4-H Program for five years. Thanks to 4-H, she feels like she'd have a shot at surviving in the woods too. When freshman congresswoman Alexandria Ocasio-Cortez released her Green New Deal plan, social media lit up with talk of her plan's mentions of “farting cows.” That drew the attention of agriculture's preeminent expert on air quality, Dr. Frank Mitloehner of the University of California at Davis, who tweeted back at the congresswoman. “I don't know whether my tweet was the reason, but a few hours after I tweeted her, all mentioning of cow flatulence were taken off the web pages and of all social media outlets and was never to be heard again,” Mitloehner told Chip Flory on the AgriTalk Radio Show Monday. …Little additional information was available on how the girls went missing or how they survived, but Honsal said they had been trained in outdoors survival as members of a 4-H program. Researcher: Tapan Pathak of the University of California Cooperative Extension in Merced, who helps farmers adapt to climate change. Put your nerd hat on -- we cover a lot of ground in this fast-paced discussion with Dr. Frank Mitloehner of the University of California-Davis about the greenhouse gas emissions associated with the meat and dairy we consume. We consider how livestock emissions compare to other sectors of the US and global economies, the carbon footprint of vegetarian diets and what is the most effective way to reduce individual carbon emissions. …“It is irresponsible and it's misguiding the public to believe that the true sources of pollution are downplayed, and the impacts of animal agriculture are grossly inflated,” said Dr. Frank Mitloehner, Professor and Air Quality Specialist in Cooperative Extension in the Department of Animal Science at the University of California, Davis. 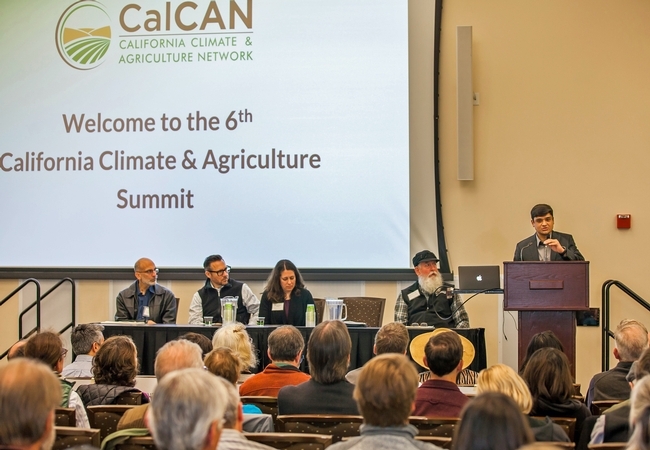 Five California leaders, including two UC Cooperative Extension scientists, were recognized for their contributions to the field of agriculture and climate change at the California Climate & Agriculture Summit at UC Davis on March 5, 2019, said a news release issued by California Climate & Agriculture Network (CalCAN). 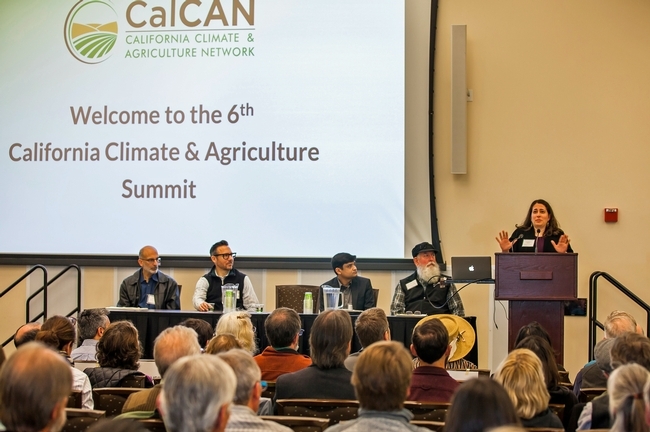 The summit was organized by CalCAN and brought together some of the state's foremost experts in agriculture — including farmers, agriculture professionals, researchers, advocates and policymakers — to grapple with the challenges of climate change and share knowledge about the opportunities facing the industry. At the summit, CalCAN presented the leadership award for agricultural professional to Ruth Dahlquist-Willard, UC Cooperative Extension small farms advisor in Fresno and Tulare counties. Dahlquist-Willard helps keep small-scale, diversified farmers in business by providing support with marketing, regulatory compliance, processing of value-added products, water and energy efficiency, and integrated pest management. She has been a driving force behind increasing access by Hmong farmers in the Fresno area to California's State Water Efficiency and Enhancement Program (SWEEP). Dahlquist-Willard has promoted the program, provided thousands of hours of one-to-one, culturally-relevant support to farmers on grant applications, and assisted with project design and installation. The farmers she has supported are now benefiting from water, energy and financial savings. "There are large environmental problems to solve in the Central Valley, and it's time for a different conversation around farming there," Dahlquist-Willard said. "I feel that there needs to be a conversation in the middle to solve problems rather than a conflict-based approach." UCCE advisor Ruth Dahlquist-Willard speaks at the CalCAN Summit. The leadership award for researcher was presented to Tapan Pathak, UC Cooperative Extension specialist for climate adaptation in agriculture, based at UC Merced. 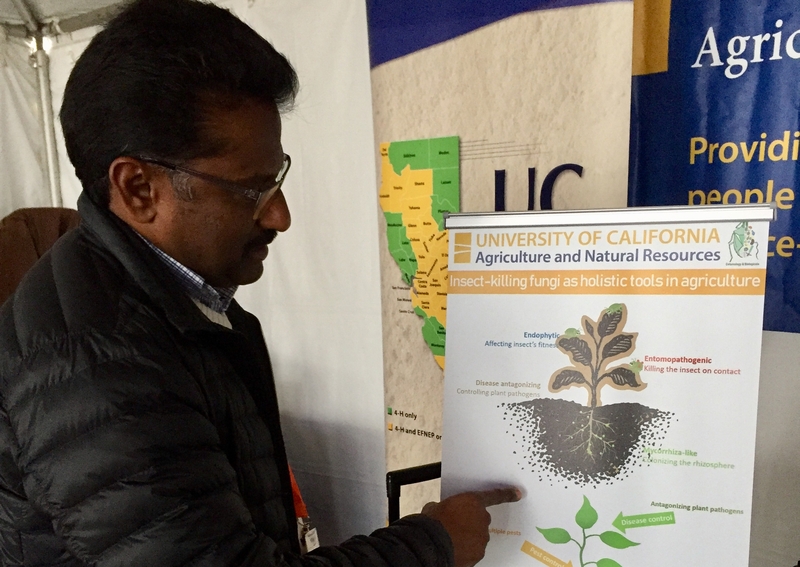 Pathak is the chair of the UC Cooperative Extension Climate Change Adaptation Workgroup, which brings together scientists across the UC system to collaborate on research and extension projects related to climate change adaptation in California agriculture. Pathak is the lead author on an important and timely paper that was published in 2018 in the journal Agronomy. It synthesizes the impacts of climate change on California agriculture and offers directions for future research and implementation. "We need more facilitated dialog with policy researchers and scientists on the science of climate change, and the implications of not taking action," Pathak said. "Given the scale of California agriculture and the pressure of climate change impacts, we need even more substantial funding for incentives for farmers and for research and tools, and we must integrate growers from the beginning of the process." 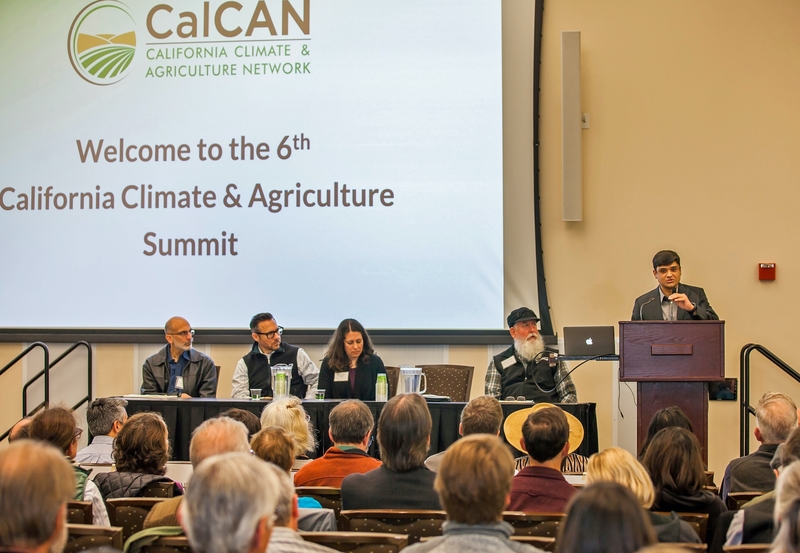 UCCE specialist Tapan Pathak addresses the audience at the CalCAN Summit. A new report released by the University of California Agriculture and Natural Resources' Agricultural Issues Center estimates the higher tariffs could cost major U.S. fruit and nut industries $2.64 billion per year in exports to countries imposing the higher tariffs, and as much as $3.34 billion by reducing prices in alternative markets. "It's generally too difficult to get trucks out on such a short notice," said Glenn Nader, University of California Cooperative Extension livestock and natural resources advisor emeritus for Butte, Sutter and Yuba counties. … Carissa Koopmann Rivers, UCCE livestock and natural resources advisor for Siskiyou County, said the Klamathon fire, first reported in early July, devastated the town of Hornbrook, which is situated in a cattle-producing area. …Ricky Satomi, UCCE forestry advisor for Shasta, Trinity and Siskiyou counties, said if there's a wildfire and a person has advanced notice, there are several things that can be done to save buildings before evacuating. A new study from the University of California Agriculture and Natural Resources' Agricultural Issues Center finds that tariffs on 10 fruit and tree nut exports alone are estimated to cost the U.S. $3.4 billion annually. …"Together, poor land management, poor land use planning and the onset of climate change, we have created the perfect environment for the perfect firestorm in California. It's completely expected and it's going to get worse," explained Dr. Kate Wilkin, a fire scientist at the University of California Cooperative Extension. ...Alternatives may be available, but they lack the punch of chlorpyrifos, which kills multiple pests at once, Beth Grafton-Cardwell, a scientist working with citrus farmers as part of the University of California Cooperative Extension, told Bloomberg Environment. …Triple-digit temperatures “preheat the fuels, and it makes them much more receptive to igniting,” said Scott L. Stephens, a fire ecologist at the University of California, Berkeley. While misguided forest- management policies are just one reason that fire has become more devastating, a warming climate and more development in California's wildlands also contribute, making planned burning vital, said wildfire specialist Max Moritz with UC's Division of Agriculture and Natural Resources. It takes time for the nitrogen found in dairy manure water to become available to feed crops out in the field, and as dairy producers don't want to under or over fertilize their feed crops, the UC Cooperative Extension is conducting a research trial to find out more regarding how manure water interacts in the soil with plant root systems. Watch this brief interview UC Agronomy Advisor Nicholas Clark as he summarizes a recent presentation he shared at the Golden State Dairy Management Conference. …Researchers with the University of California Cooperative Extension are helping do just that. In partnership with the United States Forest Service, researchers there have launched a 20-year study to identify trees that can withstand higher temperatures and lower rainfall. Native trees such as the Catalina Cherry and Ironwood trees, along with imports like Ghost Gum and Acacia trees, could form the future of L.A.'s canopy. “I think it's important that the children get to see what it takes to care for farm animals … from the cute to the somewhat smelly,” said Igor Lacan, environmental horticulture adviser with the University of California Cooperative Extension, which runs the ranch. Daniel Berlant, assistant deputy director of Cal Fire, the state's fire agency. A few years ago, University of California viticulture and pest management advisors noticed unusual leaf symptoms in certain Napa County hillside vineyards that were right next to oak woodlands. As described by the UC Cooperative Extension's Monica Cooper and Lucia Varela, the feeding activity they noted in April 2015 resulted in a “lace-like” appearance to damaged leaves. Then last year, in March, they observed feeding damage to expanding buds. … Where vineyards have come into play is when they were situated on hillsides next to oak woodlands and mixed species of white alders, madrone, California bay, and Douglas fir, according to Varela, a north coast integrated pest management advisor, and Rhonda Smith, a UCCE viticulture advisor. Yes, humans have made wildfires like the Carr fire worse. Here's how. …Many forests in the western United States are “fire adapted” said Scott Stephens, a fire ecologist at the University of California at Berkeley. Natural wildfires every 5, 10 or 20 years help clear debris from the forest floor and make room for stronger, healthier trees. …Wildfires are as unstoppable as hurricanes, Stephens said — and much like hurricanes, increasingly inevitable as the climate changes. “But you could do a lot more when you're getting ready for fire to inevitably occur,” he said. By building with fire-safe materials, establishing buffer zones between ecosystems and communities, and better caring for forests before fire season starts, some of the destructiveness of fires could be mitigated, Stephens said. …Lisa: Mr. Trump in his tweet referred to the longstanding dispute between California farmers and environmentalists over the allocation of the state's precious water resources. Both sides want more and Mr. Trump has embraced the arguments of the agriculture community. But William Stewart, a forestry specialist at the University of California, Berkeley said leaving less water for fish would have no impact on amount available for fighting fires. That water comes from local streams and rivers, where water-dropping helicopters drop their buckets. Neither he nor other scientists could point to a scenario in which California's environmental laws have prevented or curbed the use of water to fight wildfires. …Groups in six Bay Area counties will get a combined $7.4 million. The biggest portion of that, $3.6 million, will go to UC Berkeley. The Federal Emergency Management Agency in 2016 withdrew what would have been an award of roughly the same amount to thin and remove eucalyptus trees in the East Bay hills after a lawsuit by conservation activists. …Keith Gilless, chairman of Cal Fire, said the state needs to do much more vegetation management — activities like reducing hazardous plant fuels — to address wildfire risk. In the case of the northern counties, the risk will be higher because homes there often dispersed at the edge of a wildland area, said Lenya Quinn-Davidson, a Eureka-based fire advisor for the University of California Division of Agriculture and Natural Resources. Can More Logging Help Prevent California Wildfires? Cal Fire officials announced yesterday that the Mendocino Complex fire grew to over 283,000 acres, making it the largest in state history. As wildfires across the state rage on, Governor Brown and some lawmakers are calling for increased forest thinning to lessen the threat posed by fires. Those in favor of logging say that removing trees and vegetation can help reduce a fire's intensity and make forests more resilient. Opponents say thinning does nothing to protect communities from fires and imperils species that depend on dense forests. We'll take up the debate. Chad Hanson, director, John Muir Project of Earth Island Institute ; co-author, "Nature's Phoenix: The Ecological Importance of Mixed-Severity Fires"
Trump wants to clear more trees to halt fires. The feds need to spend more, experts say. Trump says California's water policies are making the wildfires worse. Is he right? William Stewart, a forestry management expert at UC Cooperative Extension, agreed. “The entity that's doing the worst job are the people working for him,” Stewart said, referring to Trump. Stewart said the Carr Fire, which killed seven people and forced mass evacuations in and around Redding, started in shrub and grasslands west of the city, not in the forests. Only lately, after the threat to Redding abated, has the fire moved north onto Forest Service land and forested property owned by Sierra Pacific Industries, he said. Cal Fire and a researcher from UC Riverside responded to Donald Trump's tweet related to the state's wildfires on Monday. "Thinning would be a good idea, but the question is how you thin properly," UC Riverside's Dr. Richard Minnich said. "There are too many trees in the ground sucking the ground dry. That's one of the reasons you had so many trees die in the Sierras." But Minnich says that there is plenty of water in California. Shasta is the biggest reservoir in the state and it's currently more than two-thirds full. Even as fires rage across California, thousands of new homes are being built deeper into our flammable foothills and forests, as lethal as they are lovely. A big reason why: It's harder to do controlled burns — one of the most effective fire suppression techniques — near residential areas, due to smoke concerns. Until the 1970's, fire suppression tended to minimize fire spread. “If homes are sprinkled through the landscape, you take that key tool off the table,” said Max Moritz, a wildfire specialist with UC's Division of Agriculture & Natural Resources. Eighty-one years from now, Turlock's climate could resemble more of southeast California's high desert areas, according to a new report that says inland California municipalities should consider increasing temperatures due to climate change when planting street trees. …"Urban foresters in inland cities of California should begin reconsidering their palettes of common street trees to prepare for warmer conditions expected in 2099 due to climate change," said the study's co-author, Igor Lacan, UC Cooperative Extension environmental horticulture advisor in the Bay Area. Will smoke taint summer harvests in the Mother Lode? Drift smoke from the Ferguson Fire has some Tuolumne County vintners and agriculturalists concerned about the commercial viability of the early fall grape harvest, but one forestry official with the University of California noted that the native wilderness of the Mother Lode has a developed adaptability to smoky conditions. Susie Kocher, forestry and natural resources advisor with the University of California Department of Agriculture and Natural Resources Central Sierra Cooperative Extension, said that “smoke taint” of commercial agriculture was always a concern during fire season. The University of California Coyote Catcher website tracks sightings and attacks. Their figures for 2018 show coyote incidents are down compared to last year. In 2017, there were 142 coyote attacks. More than halfway through 2018, San Diego is on track to stay below that number, with 64 attacks. According to the website, there have been six reported pet deaths this year. Backyard chickens are dying in droves in SoCal. Will disease spread to Valley? Maurice Pitesky, a veterinarian and University of California extension specialist in the School of Veterinary Medicine at UC Davis, said backyard chicken owners should closely watch their flocks. Symptoms include, sneezing, coughing, green watery diarrhea, neck twisting, paralysis, decreased egg production and swelling around the eyes and neck. …With guidance from University of California Cooperative Extension advisors, growers have been paying close attention to tree water stress and sugar levels in the weeks leading up to the harvest, which was expected to begin in about the third week of August. …In general, harvest can be expected roughly 30 days after the first healthy fruit in an orchard starts changing color, UCCE orchard advisor Katherine Jarvis-Shean explains in a separate blog post. She urged growers to time their irrigation cut-off to improve dry-away ratios, reduce premature fruit drop and decrease shaker bark damage at harvest. Jairo Diaz-Ramirez and five other scientists have recently completed year two of an irrigation trial for onions, testing furrow and drip irrigation, and found that their methods produced good results, without water distress or soil tension. They tested the Taipan variety of onions. 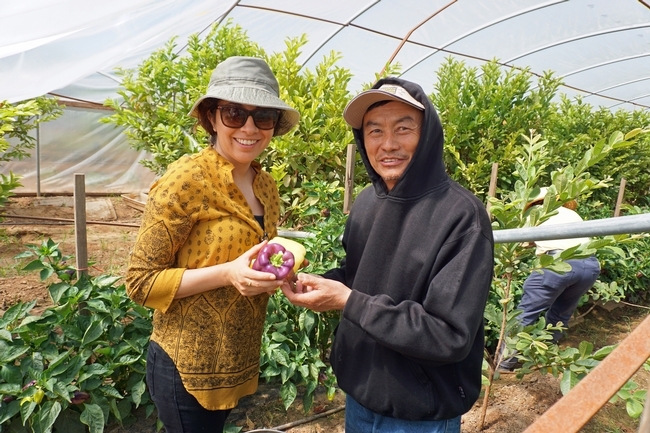 Farmer Vang Thao has been managing a successful farm south of Fresno for nearly 30 years, producing a spectacular array of vegetables – heirloom tomatoes, purple bell peppers, water spinach, bitter melon, Thai eggplant and dozens of others. Every weekend the family traverses the Grape Vine to set up a visual feast at farmers markets in Santa Monica, Hollywood, Palos Verdes, Torrance and Hollywood. Acclaimed Los Angeles chefs rave about his produce, according to a Los Angeles Times feature story on the Thao family. Produce like sweet potato leaves, amaranth and black nightshade are essential for families hailing from Vietnam, Laos, Thailand, the Philippines and India who seek ingredients for their traditional cuisine, but the market is limited. Now, small-scale farmers like the Thaos are on the cusp of something with much wider appeal. One of their crops is moringa, a tropical tree that produces an abundance of fresh shoots to sell at the farmers market booth for $1 a bundle. 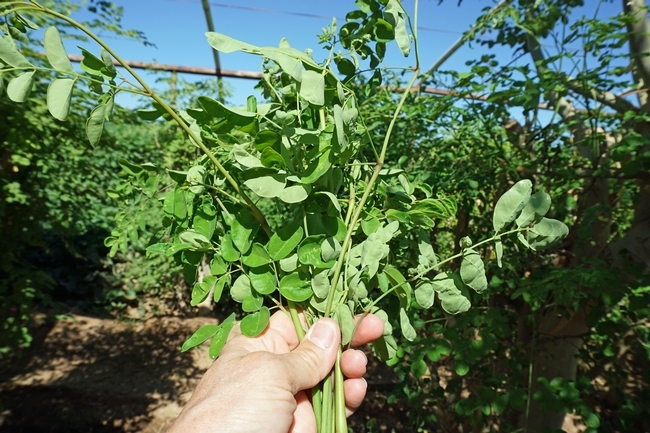 Moringa is a delicate green that can be added to salads, soups and nearly any other dish. It has a pleasant nutty, earthy and slightly pungent green flavor. While it tastes good, it's the plant's nutrient profile that is commanding attention. 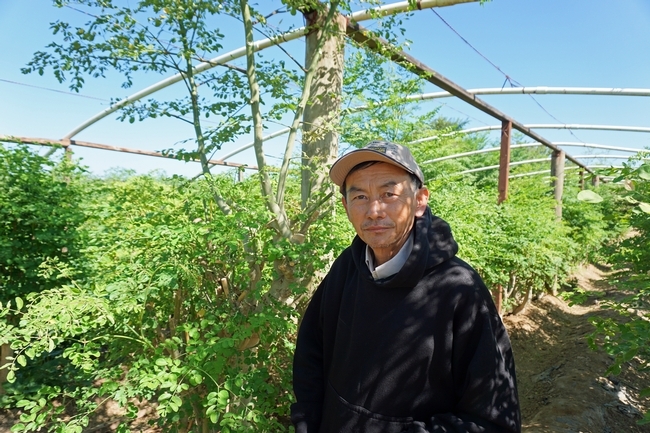 Fresno farmer Vang Thao in his moringa plantation. On the internet, moringas are called miracle trees. All parts of the plant are edible – the tender leaves can be cooked or eaten fresh, moringa flowers are considered a delicacy, the tree's young pods can be used like green beans, roasted seeds are said to have antibiotic and antifungal properties. The roots and bark have medicinal potential, but need more study to determine the right dose. A 100 gram serving of moringa greens has more protein than a cup of milk, more iron than a cup of spinach, and is high in calcium, potassium, vitamin C and vitamin A.
Moringa is the Superfood of 2018, according to the trend watchers at SPINS.com. UC Davis nutrition researcher Carrie Waterman is studying moringa's use, production and processing worldwide. She is pursuing moringa for therapeutic applications in treating cancer, HIV and inflammatory bowel disease. Vang sells small bundles of moringa shoots at farmers markets for $1 each. 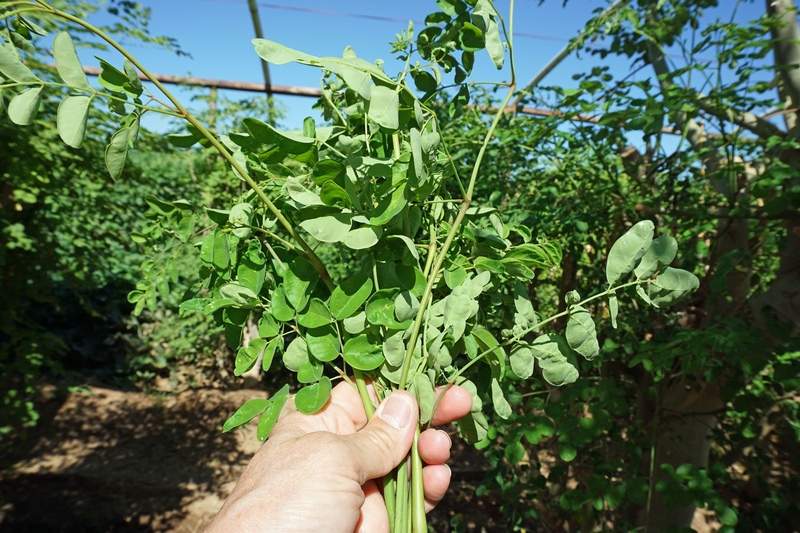 Ruth Dahlquist-Willard, the UC Cooperative Extension advisor to small-scale farmers in Fresno and Tulare counties, recognized moringa's potential to supplement income for Southeast Asian farming families who are marketing specialty Asian vegetables and herbs to immigrant communities. Supporting farmers growing moringa in marketing the product to new buyers is an objective of the UCCE moringa project, a partnership with the UC Sustainable Agriculture Research and Education Program, which was funded by a California Department of Food and Agriculture specialty crop block grant. Lorena Ramos, the project lead, is working on developing marketing materials, outreach opportunities, and value-added options. UCCE moringa project leader Lorena Ramos and Vang Thao with purple bell peppers. While using moringa is second nature for many immigrant groups, expanding the market includes demonstrating how easily the green can be used in the kitchen. 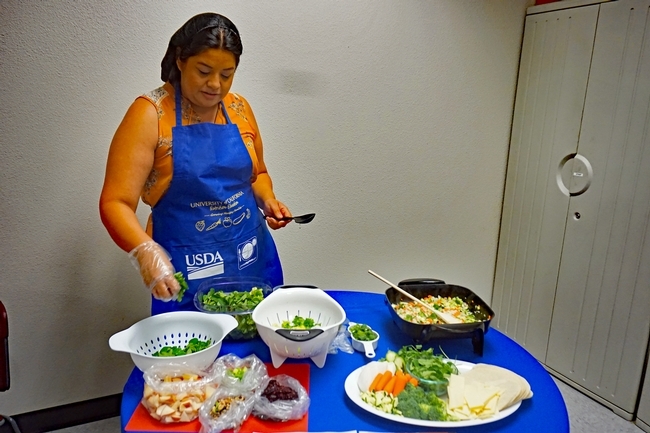 Dahlquist-Willard and Ramos called on another sector of UC Cooperative Extension – the UC CalFresh Nutrition Education Program – for assistance. 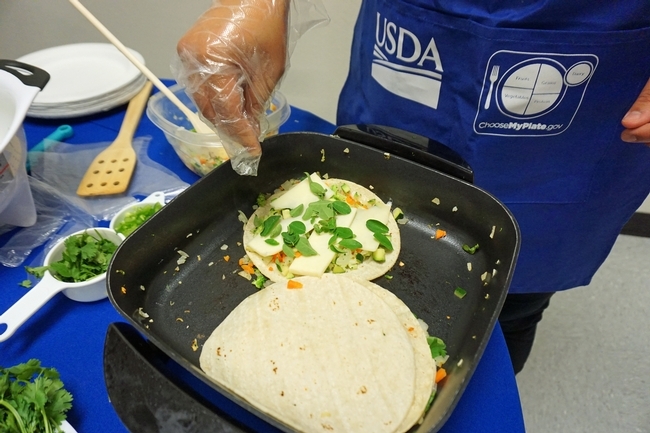 UCCE offers nutrition education in schools and community settings to children and families eligible for the USDA's nutrition assistance programs. Each year, Fresno State dietetic students serve two-week internships at UCCE. In 2018, one of their tasks was developing creative, healthful recipes incorporating moringa. Among the recipes were overnight oatmeal, pesto, smoothies, guacamole and energy bites – all with moringa. “We are publishing the best recipes to share with the public to help them add this nutritional green into their diets,” Ramos said. Recipe cards and moringa samples will be available July 26 at the Fresno Food Expo, where UCCE is hosting a booth to raise awareness about moringa by introducing farmers to Fresno area chefs, buyers and consumers and sharing information about the vegetable's health benefits, culinary versatility and its ability support small-scale farmers in Fresno and Tulare counties. Fresh moringa can be easily added to many recipes. Collect, dice, shred and measure all ingredients before starting to prepare the recipe. Spray a large skillet with cooking spray. Add zucchini, broccoli, green pepper, onion and carrot. Cook vegetables on medium heat for 4 to 5 minutes, stirring frequently. Remove vegetables from skillet, and put on a clean plate. Spray skillet with cooking spray again and place 1 tortilla in the skillet. Top with ½ cup vegetables and 1/3 cup cheese. Sprinkle on fresh moringa leaves. Place a second tortilla on top. Cook on medium low heat for 2 to 3 minutes or until the cheese starts to melt and the bottom tortilla starts to brown. Flip over the quesadilla. Cook for another 2 to 3 minutes until tortilla brons. Cut each quesadilla in half or quarters, serve hot with your favorite salsa or other toppings. Refrigerate leftovers within 2 hours. Eat within 3 to 5 days. UCCE agricultural assistant Michael Yang, left, and Vang Thao snack on a freshly picked melon during a field visit. UCCE nutrition projects coordinator Evelyn Morales demonstrates moringa recipes.